2. Clean the electrode with distilled water and wipe clean the spare water. 3. Press the "ON/OFF" button. Switch on the meter. 4. 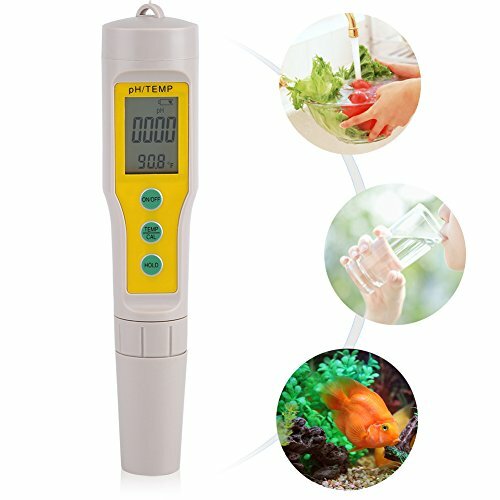 Immerse the PH meter electrode in the solution for testing. 5. Lightly shake the meter, read the data when the numeric stabilized. 6. Press the "ON/OFF" button to shut off the instrument. >1. Full standard buffer solution ph 6.86, in clean beakers. >2. Fill 2 beakers, one is used for cleaning the electrode and the other one is used for calibration. >3. Turn on the power. >4. Put meter into buffering solution. Press "cal" about 5 seconds when screen show until screen show the value is the same with buffer solution. Product Size: Approx. 183 * 37 * 37mm / 7.2 * 1.5 * 1.5"
【Digital PH Pen & LCD Display】Large and clear LCD, easy to read and accurately measuring functions.